Another day, another programmer directed by Lew Landers. I'm really enjoying exploring some of his films, and FLIGHT FROM GLORY was one of the best yet, a compelling story about a group of outcast pilots working for a rickety air delivery service in South America. George Wilson (Van Heflin) and his bride Lee (Whitney Bourne) arrive at a far-flung outpost in South America for George to begin his new job flying deliveries over the Andes. George, like the outfit's other pilots, had lost his pilot's license in the U.S. and welcomed the chance to fly again, not realizing it would involve piloting decrepit planes over dangerous routes. The pilots each go into debt to their employer almost immediately, making it hard to pack up and leave. 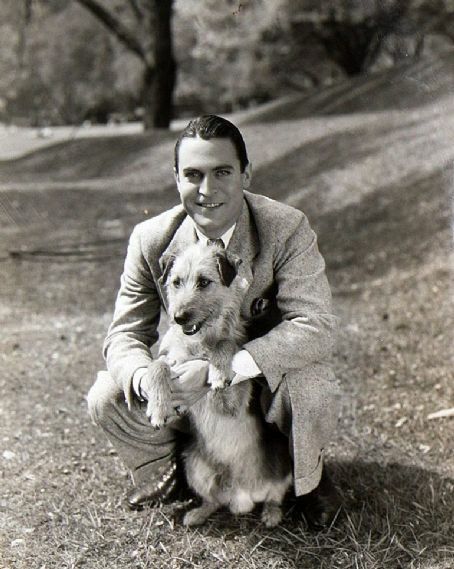 Senior pilot Paul Smith (Chester Morris) tries to convince the Wilsons to leave, or at least for Lee to return home, but she's made of tough stuff and wants to stand by her man despite the poor living conditions and the daily threat that a pilot will crack up. Unfortunately her husband responds to their challenges by hitting the bottle. The film manages to create a rich atmosphere on a shoestring budget. Some of the developments are fairly melodramatic, but within the context of the story it's all of a piece and makes sense. And it certainly doesn't hurt that an actor of Van Heflin's caliber is at the center of some of the most startling action. This was just Heflin's third film, and he looks impossibly young at times. Whitney Bourne was seen earlier this week in Landers' DOUBLE DANGER (1938), and she's equally good in this as a glamorous-looking wife who at first glance is too fragile for the harsh living conditions. She gamely tries to make the best of it, sewing curtains from bath towels and trying to encourage her husband, who becomes increasingly impossible to deal with. There's some interesting information about Bourne's background in the comments following my DOUBLE DANGER post. The supporting cast includes Richard Lane, Douglas Walton, and Paul Guilfoyle as pilots, Onslow Stevens as the nasty man running the flight business, and Solly Ward as a Russian mechanic. Rita La Roy plays Molly, the surly cook. This movie was filmed in black and white by Nicholas Musuraca, as were many other RKO programmers of the era. Musuraca would later shoot many of RKO's best films, including several Val Lewton titles and a number of film noir classics. FLIGHT FROM GLORY was released on VHS in the excellent RKO Collection. 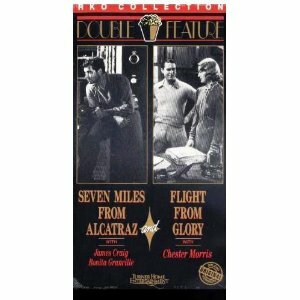 It's a "double feature" tape also featuring Edward Dmytryk's SEVEN MILES FROM ALCATRAZ (1942) which stars James Craig and Bonita Granville. Films directed by Lew Landers which have previously been reviewed at this site: THE MAN WHO FOUND HIMSELF (1937), DOUBLE DANGER (1938), SKY GIANT (1938), SMASHING THE RACKETS (1938), TWELVE CROWDED HOURS (1939), STAND BY ALL NETWORKS (1942), and THUNDER MOUNTAIN (1947). Haven't seen the film but it reads in your presentation as a dry run for Only Angels Have Wings. Good to know the pedigree. Yes? ONLY ANGELS HAVE WINGS (1939) is one of a small number of Cary Grant films I haven't seen yet, but from what I know of it this film does seem like something that might have inspired the later film. 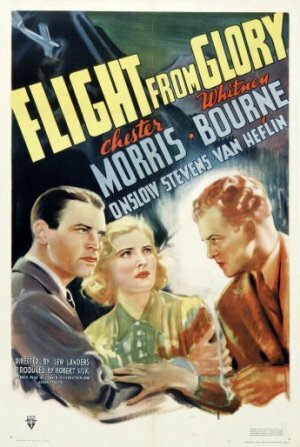 As I've thought about FLIGHT FROM GLORY further, it also has a touch of RED DUST (1932). I'd like to see this one, for Van Heflin, if nothing else, though I really like the premise and would like to see how the plot turns out. I think you might like this one, Deb. I really enjoyed it. Hope you can catch it sometime! Of the Landers movies I've seen so far I also rate this as one of the very best. And I can attest from having seen it that it definitely was a direct influence on ONLY ANGELS HAVE WINGS. Hawks' movie is a masterpiece but doesn't take anything away from this one, which is fine in its own right. Laura, I would encourage you not to wait until next year to put ONLY ANGELS HAVE WINGS on your list of ten classics to see but just go ahead and see it this year. Give yourself a treat, you know. I can't predict every movie you'd like but I'd bet plenty on it in this case. Thanks for your feedback, Blake! OF the six Landers films I watched this week, this one and DOUBLE DARE were my favorites -- each much different in tone but each also done with a lot of polish for a programmer. I have a feeling I'll like ONLY ANGELS HAVE WINGS too! I certainly love a number of people in the cast. I was disappointed I was unable to see it at UCLA last year, that would have been a great introduction. I've got a videotape of the film here, though, and agree it would be a good goal to finally watch it this year too. :) Thanks!